Have you ever cut all the pieces for a woodworking project then tried to put them together and found that they just don't fit together nicely? Could it be that the one tool you rely on most, your square is not giving you a proper angle reading ? One of the most frustrating things about woodworking, especially for new woodworkers, is when you are working away on your project and it comes to starting to put it together and it just doesn't fit nicely. There are gaps in the joints, some of the angles seem to be off a bit, it just isn't coming to gether nicely. When this happens, you get out your square and start double checking your cuts and if your square is off to begin with, measured one way, your cuts will be perfect, but reverse the square and if the joint is WAY OFF when reversed, then your square is the problem, not your woodworking ability. In many cases when this happens, you cannot go back and re-set up the machinery and re-cut the wood because it will be too small, so now you have a very expesive stack of firewood, or more wood for your cut-off pile that hopefully you will have a use for one day. ... and so on, and all of these squares have some sort of purpose in mind by their manufacture or designer. The art of woodworking, for many means precision cuts and precision joints. We all see and hear about it daily in woodworking magazines, on YouTube and in looking a people's projects. Perfectection in woodworking joints is the ultimate goal for many of us. We purchase machines and set they up to within thousandths of an inch, all to make perfect cuts. Then what happens ... and I see this ALL THE TIME ... we check our joints and cuts with squares that are not designed for that job, or that are infact imperfect in their design or manuafacture. I have talked about this in some of my videos but this needs a topic and video of it's own. Lets look at a designs that sometimes don't work as well as they look. For this I refer to squares that incorporate wood in part of their design. Oh they look great, and they are not cheap either, some even have a nice brass edges, but the problem with them is the same problem inherent in ALL WOOD, and that is, that it is always taking on or giving off moisture which means wood movement. Wood movenment in a square means that sometimes it will be accurate, other times not ... how do you know when your wood-steel square is giving you accurate readings?? These kinds of squares have been used for years, but for giving very fine accurate reading, you may want to double check it against your engineer's square. AND, you may want to keep checking it because it is likely going to change according to the moisture content in yoiur workshop as it varies from summer to winter. The next square is also often wrongly used is the adjustable tri-square. This square was originally designed to for use in carpentry and construction. The idea is that it was small enough to fit in a carpenters tool belt, was adjustable for both right angle and fourty five degree cuts and even had a rudimentary level in it. Why on earth would we be using a square like this in the woodworking shop? These squares are great for carpenters who don't need precision joints and who are happy using circular saws not table saws with precision fences. The problem with many of these adjustable tri-squares is that they are held together by a smal brass nub, which leaves way too much room for error due to wear and tear on the brass nub. 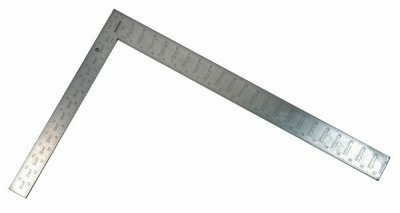 Tri-squares are great, handy tools, but they are designed for a specific purpose and need to be used correctly. So where does that leave us? Well, any good carpenter also relies on a full size Framing Square when they need precision cuts, angles and joints. even carpenters don't rely onb tri-squares for accurate measurement. Full size squares are made of steel, (well, some of the new ones are also made of aluminum or similar stable material) they are not adjustable and they are dead accurate no matter what the weather, humidity or temperature. My favorite square, which is also being sold a in most woodworking supply stores these days, is the Engineers Square. Again these are all steel design and are dead accurate all the time. Many have one edge thicker than the other which makes them easier to use, and they come in a variety of sizes.There are also smaller steel squares, similar to a builder's square, that are less expensive and are just as accurate, and I use these a lot as well. I learned the hard way years ago, that when you are cutting and measuring and trying to make accurate angles and cuts you need to be using accurate tools, not necessarily expensive, because many of them are not, they a simple accurate tools, and if you find sometimes your joints are off a bit, maybe one place to look is the quality of your squares.